Initial impressions? Not bad! St Pancras Grand is housed in a large room with a gilt-edged ceiling and a confident sense of its own importance. Golden lights suffuse the well-spaced tables while comfortable banquettes, smart napery and the presence on the menu of English lobster and potted salmon almost evoke the halcyon days of gracious rail travel. I say almost. 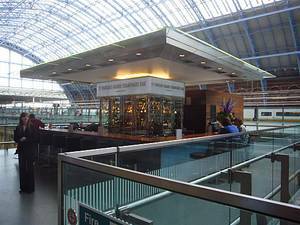 Inside the muffling restaurant on the upper concourse, there is no proper view of the soaring splendour of St Pancras station, which is one of the joys of going to St Pancras station in the first place. Big mistake. Big shame. The second problem with trying to be stylish about travel is that travellers will always let you down. A passer-by leaves her dirty paper coffee cup on one of the restaurant’s outside tables. Then a rumpled, dusty commuter sits down at another table, mistaking it for public seating. He drops his bag and slumps, like a deflating balloon. No one moves him. Why should they? The restaurant is almost completely empty. So too is the champagne bar opposite. Both are owned by the Searcys group, who have obviously drilled their staff in the art of the hard sell. Poor, swivel-eyed waiters loiter outside on the concourse, trying to entrap passing trade like timeshare sellers on the Spanish costas. Any minute now they will be resorting to boathooks to lure customers inside. A sharp tap on the collar with a fishing gaff, S feels, would do the job nicely. On the menu there are sections such as Classics, Smoked & Potted Seafood, Caviar and something called the ‘Cold Meat Counter’ – oddly depressing! 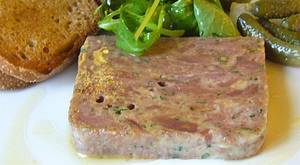 – which include preparations such as pickled herrings; cold omelette with Keta ‘caviar’ and soured cream; Constance Spry salad with salad cream; rare beef with Russian salad; and jellied ham and piccalilli. 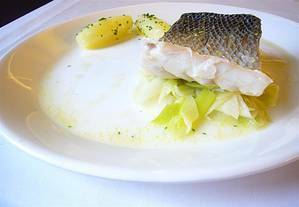 Main courses include fish and chips with mushy peas; grilled plaice with tartare sauce and new potatoes; calves liver and bacon with onion gravy and mashed potato and bubble and squeak with poached egg, spinach and Hollandaise. The aim seems to be quick comfort food with the occasional edge of luxury and a British bent. Fair enough. We order pressed duck with peppercorns from the Cold Meat Counter. Pressed Duck? Compressed by a Hydraulic Pump Duck would be more accurate. S does not hold out much hope for this starter, and he is right not to. The pile of pulverised meat looks unappetising and tastes like some hellish new strain of grease-rich corned beef. Another dish, potted poached organic salmon, sounds like the stuff of nightmares; a squelch of fatty farmed salmon battered into a ramekin. It seems a little misguided, a bit like the St Pancras Grand Fish Pie at £11.75. ‘What’s in it?’ S asks a waiter. ‘Farmed salmon and farmed halibut,’ she replies. ‘What’s grand about that?’ he says. So far, the tastes have been muted and the production bland. Indeed, so far, so very, very Searcys – a catering and hospitality organisation - despite the modish attempts to tart up the menu in a media-friendly way. However, in the end, it is the wine list that really sums up the real intentions of Searcys and St Pancreas Bland. The ethos does not seem to be ‘how can we show some hospitality and goodwill to these travelling customers’ but ‘how can we best trick these suckers out of their hard-earned wages?’. The wines are not organised by price, varietal or country. Instead, they are juggled in a haphazard way on the list, in a manner which one can only assume is designed to fiscally confuse. In the end, this is a great train robbery. Only the dazed, confused and quite possibly lost would eat here, instead of saving their money to dine somewhere decent in Paris and beyond. And anyone arriving in the UK from Europe and having their first meal in this restaurant would only have their prejudices confirmed about British food. St Pancras Grand, St Pancras International, London NW1 2QP. Tel: 0207 870 9900. Lunch or dinner, £70 for two, excluding drinks and service.